Zeb Bell - A Professional Voice for You! Zeb At The Ranch - Live! Have you missed a broadcast? Now you can catch up when it's convenient for you! 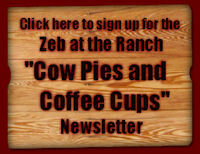 Click Here for the Zeb at the Ranch Archives. Lunch Bunch Special Edition: Celebrating Russell Smith's 92nd Birthday! Zeb at the Ranch "Lunch Bunch" April 20, 2017 at Denny's in Burley, Idaho. Special Edition celebrating Russell Smith's 92nd birthday. 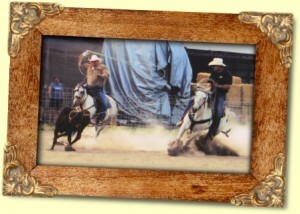 Zeb has thrilled PRCA rodeo crowds from Washington to Wisconsin since 1974! He has been an active PRCA Team Roper and NCHA Cutter himself, so you can be sure that his voice generates a "Western Hospitality" that grabs each rodeo fan and encourages every cowboy out of the chute! Beyond the rodeo circuit, Zeb is also one of Southern Idaho's best known radio and sports personalities. He can work "audio magic" on your TV or Radio commercial. Zeb receives praise for his motivational speaking and is able to share his experiences with your audience showing them how they can transform their lives and achieve greater success! Zeb can excite or please a crowd or sell your product or service! Even Cowboys Like a Little Rock 'n Roll...Especially Saluting America!